Purdy Neat Place started in November of 1973 with a union and a dream. In January of 1991, the dream started to become reality when we moved our family of 4 children into the home we built on a 90-acre tract on Purdy Road in the Town of Lockport. We have seen all of our children graduate from high school, go on to college and move forward in life. 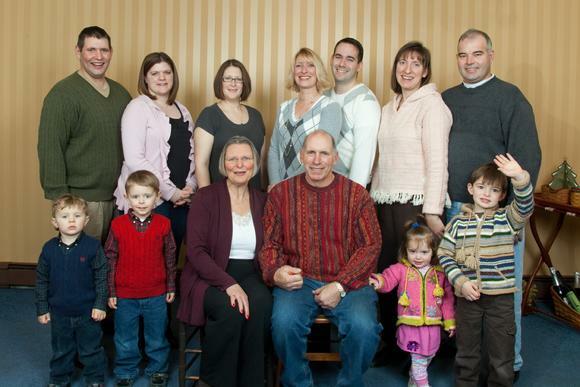 At present, our family has added a son-in-law, a daughter-in-law and four grandchildren. Our family continues to grow with the expected addition of another son-in-law in 2011. It is through all of them that our dream lives on. The kids get matching pj's each xmas. We are fortunate to have our grandchildren visit the farm often. Michael (age 7) and Matthew (age 4) are here several times each week. Jacob (age 6) and Jordan (age 3) visit several times throughout the year. Their wonder and curiosity keeps us young and motivated. We take great pride in being able to offer them hands on experiences to the lifecycles of our farm. Pictured are the four grandchildren during a recent holiday gathering. Youngest to oldest - Jordan, Matthew, Jacob & Michael.